What do think of when you think of technology? Computers? Smart Phones? I would bet that a lawn mower does not place anywhere on that list. Why not? It is technology that makes this mower great. Without technology battery power would not be able to handle something as time and power intensive as cutting the grass. It is technology that makes this mower smart enough to switch from one battery to the other when it is expended so you can keep mowing without interruption. Like the box it comes in says, “Powered by Innovation, not by gas”. I know it sounds like I have ‘drunk the kool-aid’. I haven’t. I am speaking from experience with this mower. As with anything I purchase I research and I read a lot of reviews. 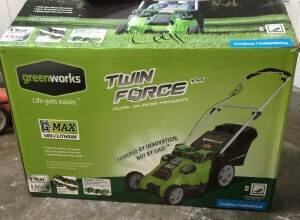 I wanted an electric mower without having to use a power cord. 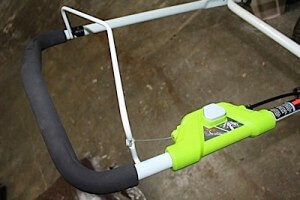 I have a Black and Decker corded mulching mower that I have used for years. It has been an easy keeper. I clean under the deck and keep the blades sharpened. I recently had to wrap the handle with cute duct tape because it was so worn. That’s how much I have used this mower. The only real drawback is being tethered with an electrical cord. I decided to take the plunge when Amazon had this on one of their Gold Box deals. As soon as it arrived I immediately unpacked the batteries (It runs on 2 batteries.) so I could get them charged up for the first mowing test. Would it pass? I read the manual. Although I have a Black and Decker I figured this mower would work a bit differently, and it does. 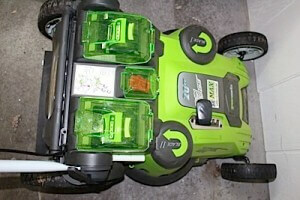 You can see in these photos that the top of the mower is very compact and space efficient. 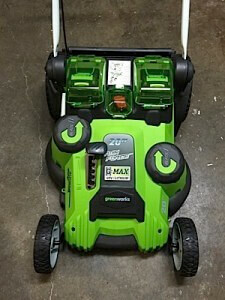 It displays where the twin blades are located, the lever for adjusting mowing height, 2 chambers for the batteries and the safety key are all located on top. The safety key is inserted between the battery compartments. If it is not inserted, the mower batteries do not engage. 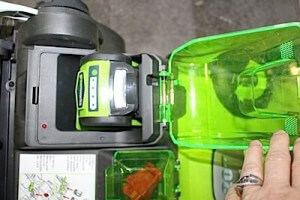 Each battery slides in and ‘clicks’ into place in its own compartment. 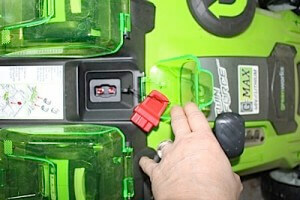 The start button on the side must be pushed and held while pulling back on the bail for the mower to engage. Once the bail is released the mower shuts off. The handle is nice and cushy for comfort. 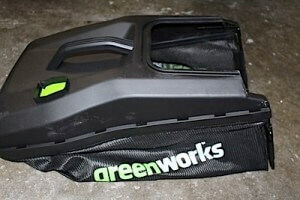 It comes with a grass catcher, but I have never used one. I don’t intend to start. I always use mulching mode when I cut the grass. It comes with the mulching attachment already in place. After charging the batteries and inserting them I was ready for my first grass cutting / mulching session. Would it pass the test? I will admit that it was a little disconcerting when the battery switched from the expended battery to the other fully charged battery. It sounded like it was running out of power and was going to stop. It switched over and I continued to mow and complete the lawn without interruption. I have no small lawn. It takes a while to complete it. Having enough battery power was a real concern. There were some reviews that stated this mower would only be good for small lawns. Larger lawns would require intervals to stop and recharge the batteries. I am SO glad they were wrong. I have used this mower now several times and I have not experienced any battery issues nor uneven cutting with the twin blades. It maneuvers easily and cleans up nicely. No oil. No gas. Environmentally friendly. Am I happy with this mower? Yes. 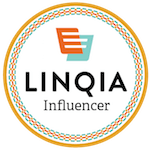 Getting it at a discounted price… Icing on the cake! Seems you got yourself a great and environmentally friendly lawn mower, Cheryl. Haven't got a lawn myself, but if I did I would have a look at it. If you can get in Europe. Hi Cheryl. Congrats on the new mower. 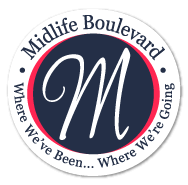 I can't say that lawn mowers excite me, but I know they are important in keeping our lawns look nice, and the easier … The better. Enjoy! I like the new battery powered mowers. My parents use one similar to this that they picked up last year. The thing is nice and quiet and does a great job on their yard. I have an electric mower that mulches. I love the work I get from it but the cord can be a pain in the heiny. If you have a lawn, which many people here avoid because of the drought, then its essential to get a decent mower. even then it's SO much work if the lawn is any size. Glad you found one you like. While we do HAVE a lawn, we also have a lawn care service. So whatever they use will have to work. I will say I like the compactness of this one you are reviewing. Thanks for doing the research on it.